Dr. Alexandra Chebil is a sports vision specialist in Orange County CA providing athletes with vision correction procedures such as custom Lasik or PRK based on the specific sport they play. Why a Sports Vision Specialist? With any competitive sport, improving performance is essential. Having excellent vision without contact lenses or eyeglasses eliminates distraction and vision distortion when the athlete is engaged. A sports vision specialist is experienced in treating athletes and understand the demand and requirements necessary for an excellent outcome. A sports vision specialist understands that athletes must have excellent central and peripheral vision along with great depth perception. Allows an athlete to have good perception all around. In active sports, it means an athlete can see things moving in from the sidelines without having to move their head. This ability naturally improves reaction time and performance when in a competitive sport. When we can see clearly and focus straight ahead, see details sharply. The central vision only covers about 3 degrees of the visual field, but it allows an athlete to make very important decisions like estimating distance and understanding fine details in the path ahead. Central vision problems, especially astigmatism are often corrected with thick, high prescription glasses, or contact lenses. Contact lenses and eyeglasses are not ideal options for athletes because eyeglasses are a distraction and contact lenses cause distortion if they are displaced when an athlete is engaged in an active sport. An experienced sports vision specialist also knows that athletes need great depth perception. This is best accomplished with 100% custom visual correction. 3D vision provides great hand eye coordination which is essential with tennis players and other racket sports. PRK or Lasik for Sports Vision Correction? What an experienced sports vision specialist will recommend is the laser vision correction treatment best adapted to the sports a patient is playing. PRK treatment is the best option for sports that have a lot of contact such as football, boxing, MMA fighting, or kickboxing. 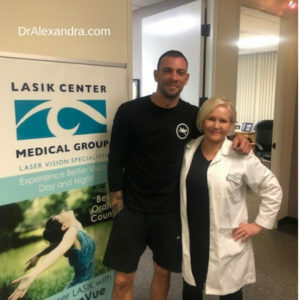 Dr. Alexandra Chebil is the sports vision specialist of choice for many athletes, MMA fighters, and other sport figures. PRK is a safer option for contact sport athletes because there is no danger of movement of a Lasik flap. Lasik can also be a great option, and offers a quicker recovery for those sports that do not have high impact or repeat trauma such as golf, swimming, racing, and good peripheral vision is necessary. If you lead an active lifestyle, participate in sports, or an athlete looking for an experienced sports vision specialist in Orange County CA. It’s time to talk. You owe it to yourself to discuss your vision correction options with Dr. Alexandra Chebil, the ophthalmologist of choice for athletes nationwide. She has performed over 50,000 vision correction surgeries at Lasik Center Medical Group, private Irvine practice. Private, personalized, and flexible after hour appointments are available for athletes and celebrities that require complete discretion. Dr. Alexandra Chebil is involved in the treatment from the first visit, to long after the procedure is done, including all the follow up visits. This meticulous approach and personalized attention to each patient has earned her the respect of the thousands of patients, athletes she has treated, and colleagues alike.